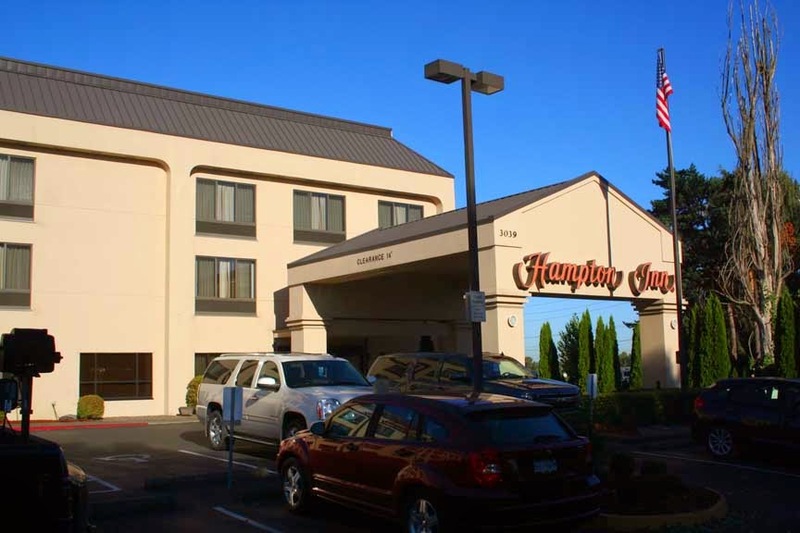 During a recent trip to see aging friends in central Oregon, we wanted to get just a bit closer than usual before stopping for the night and decided to try the Hampton Inn in Gresham, Oregon, just outside Portland. We were quite pleased with what it provided. Like most Hampton Inns, it provides fairly basic accommodations, but generally done well. For example, the bathroom in our room was small but laid out very efficiently, with the sink and vanity on an angle to make the most of limited space. The layout also provided a mirror arrangement that allowed front, side, and back views – very helpful when getting ready for an important meeting or event. Our king room had a comfortable king-sized bed, though the pillows were a little soft for our taste. The room also had an armoire instead of a closet, leaving more floor space available for other things, including an easy chair and ottoman, a desk/workspace, and a cabinet that held both a small fridge and a microwave. The down side is that storage is more limited than rooms with closets. 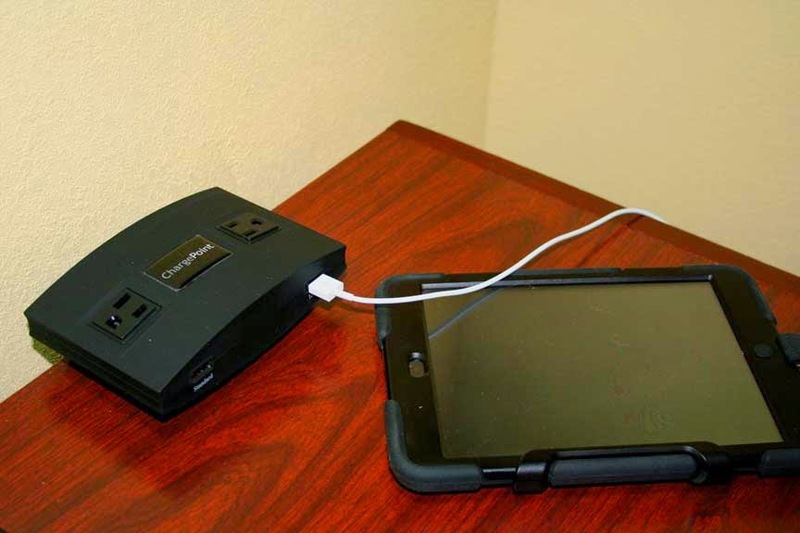 On the night table next to the bed, Hampton Inn had installed a ChargePoint with two A/C outlets and two USB outlets to charge the variety of electronics with which we travel. Those were in addition to the two outlets on the desk, the wall outlets nearby and those in the bathroom. On that same table was a handy little card with TV channels on one side and a few restaurant recommendations on the other. Although we know Portland and had dinner at Gustav’s, a favorite German restaurant on Sandy Blvd., the card could prove quite handy for someone just passing through. Free internet access was provided for up to three devices but the speed was a hotel-typical 1.0 Mbps, making sending and receiving large files such as PowerPoint presentations a slow process indeed. My office at home, using our cable provider, is about 50 Mbps. Still, the speed is enough for basic tasks like checking e-mail and even streaming Pandora so we could have some music in the evening and the morning. The room had most of the amenities travelers expect including a hairdryer and high-quality Neutrogena soap, lotion and hair products. The armoire held an iron and ironing board. 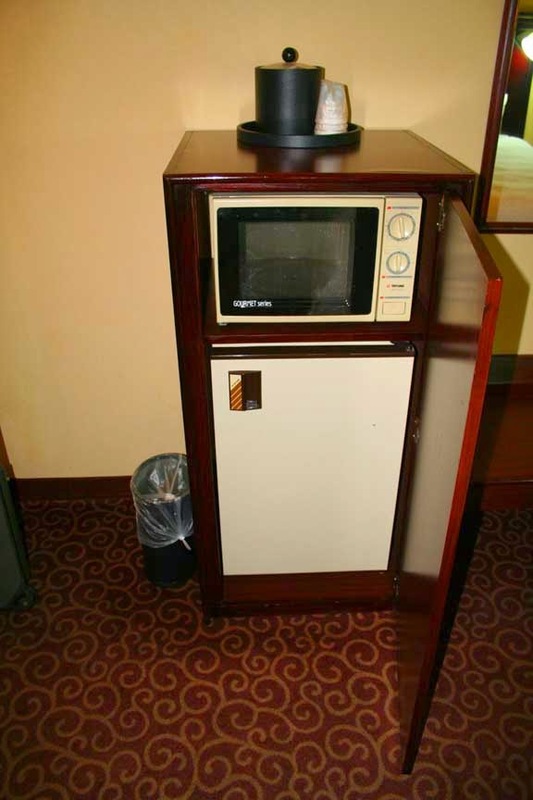 There were three things that struck me as minor misses: the room was lighted by compact fluorescent bulbs (CFLs), but the bulbs the hotel had chosen gave off a harsh light such as one might find in an office. Bulbs with much softer light are available and would be an improvement. Second, the room did not have an in-room safe, which provides an additional level of security when leaving one's laptop or iPad in the room. Third, the doors were not especially soundproof, a fact accentuated by rude neighbors who opened their door and shouted to another member of the party who was headed for the elevator. Sheesh. Still, things like that can happen anywhere, so I don’t fault Hampton Inn for that. Breakfast is included and, while it’s not cooked to order, there is the option of cooking waffles, enjoying oatmeal and other hot items, or getting a “Grab n Go” breakfast in a sack and hitting the road. There’s an indoor pool and fitness center as well as a shared computer in the lobby for those who don’t have or chose to travel without their own. 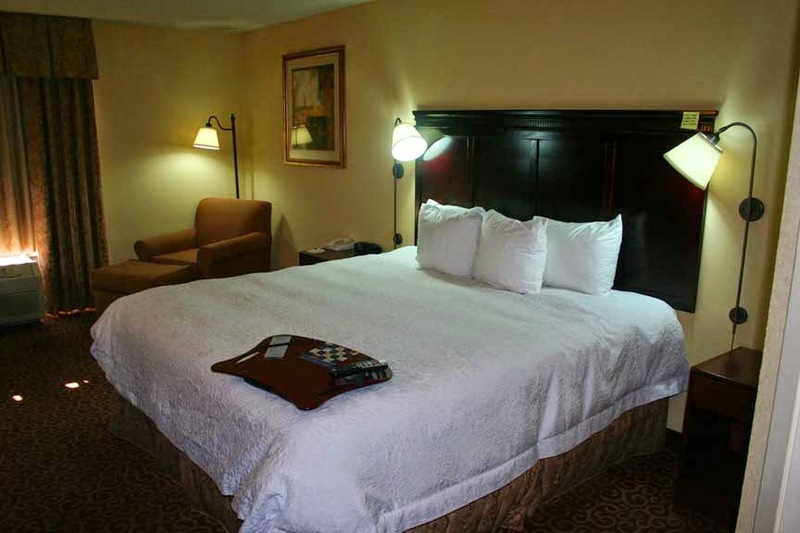 While it could not be described as “upmarket,” the Hampton Inn in Gresham provides clean, comfortable accommodations at a favorable price. Located just north of I-84 in an area surrounded by business parks and farmers’ fields, it’s convenient when it comes time to get back on the road but you’ll have to drive rather than walk to dinner or breakfast if you choose to go off property. Still, all things considered, we’d definitely stay there again.